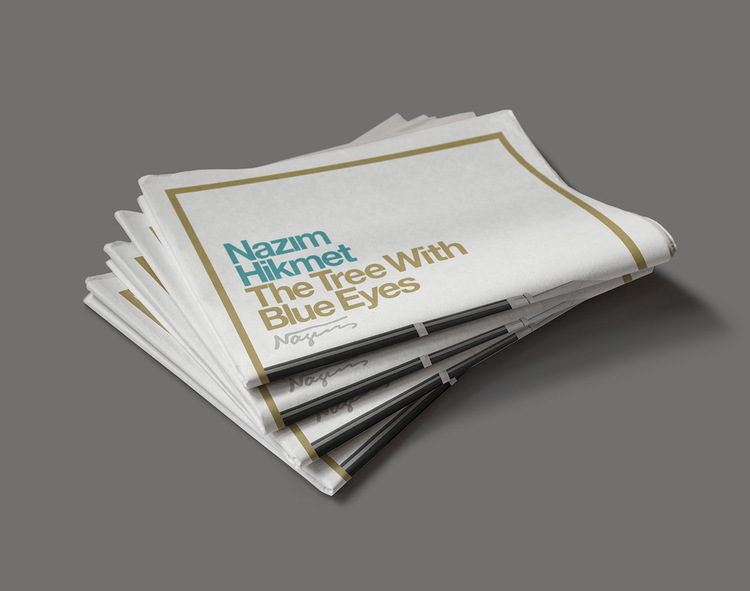 The Tree with Blue Eyes, a beautiful publication from Turkish-born, LA-based designer Ozan Karakoç, celebrates the work of exiled Turkish poet Nazim Hikmet. 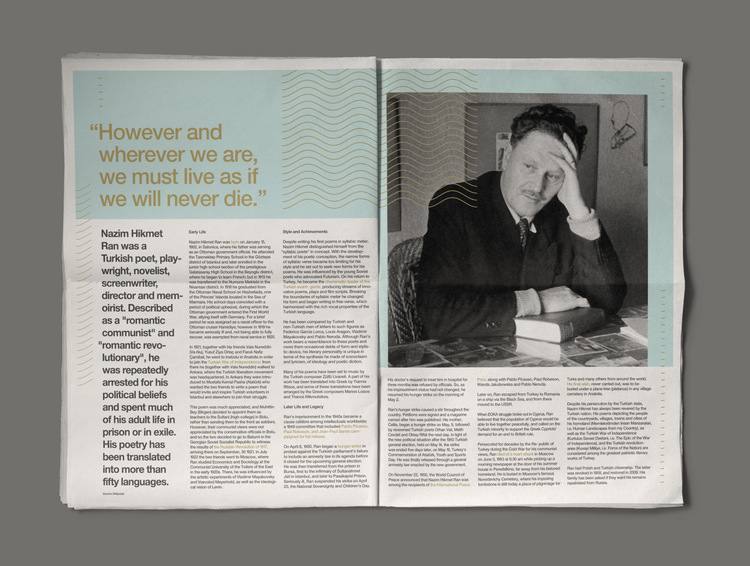 Considered the first modern Turkish poet, Hikmet's politically-charged work has been translated into more than 50 languages. He was awarded the International Peace Prize in 1950 and, more recently, Unesco declared 2002 the Year of Nazim Hikmet. Still, says Karakoç, this great poet is little known outside of Turkey despite his "modern style and brilliant way of using language". 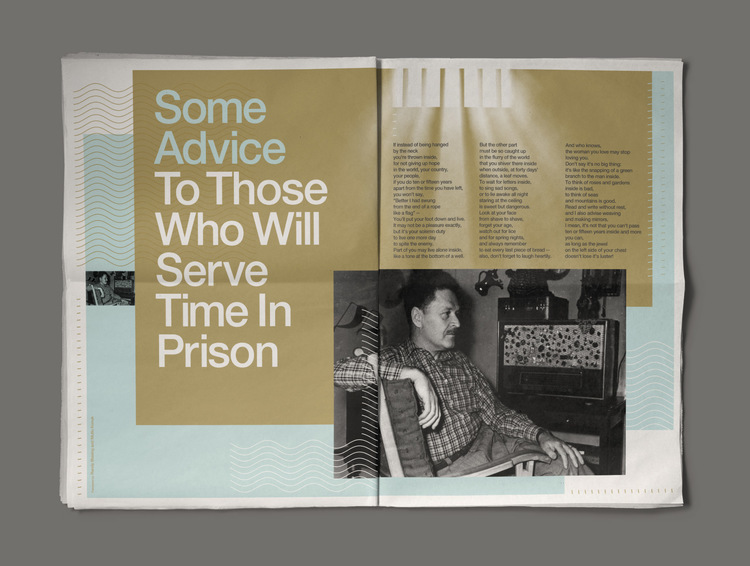 Karakoç's 24-page digital tabloid presents a collection of Hikmet's most powerful poems, including "I come and stand at every door", written in response to the attack of Hiroshima. The anti-war poem has been performed as a song by musicians including Pete Seeger and The Byrds. "Nazim Hikmet has always been a true inspiration for me. His life story, his ideas, his humanity, and his incredibly realistic and touching poems. 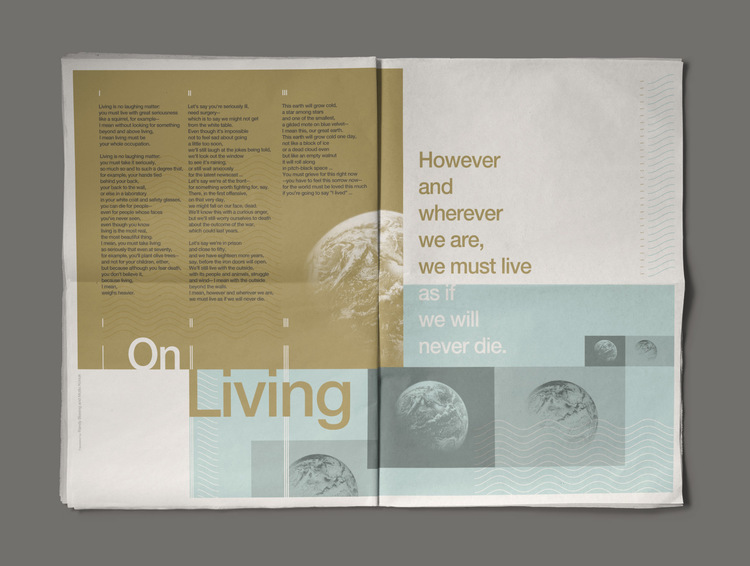 'However and wherever we are, we must live as if we will never die' he writes in 'On Living', one of his most inspirational poems." "He loved his country more than anyone else, but he was called 'the traitor' because he criticised the government. They judged him, they arrested him and he lived more than 12 years of his life in prison because of his thoughts and poems." 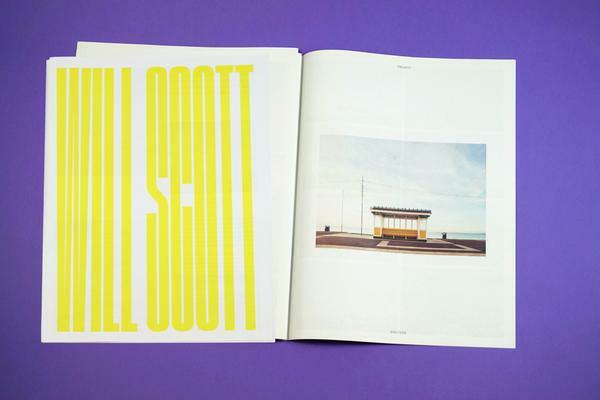 "I chose to dedicate something to his respectful memory – to introduce him and his work to people who don't know him. That's why I made the newspaper in English." "Grieving for the fact that the earth will grow cold millions of years later," says Karakoç. "This is true inspiration." 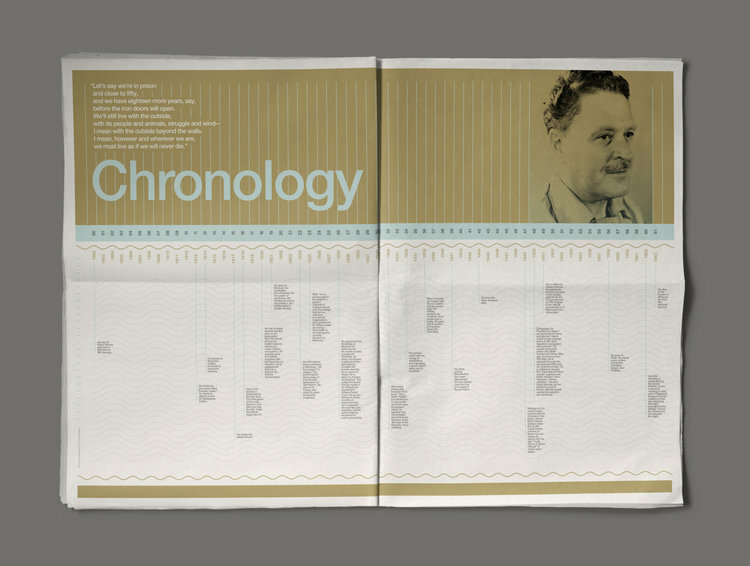 Learn more Nazim Hikmet, and read his poetry, at Poets.org. Learn more about our digital tabloid newspapers. 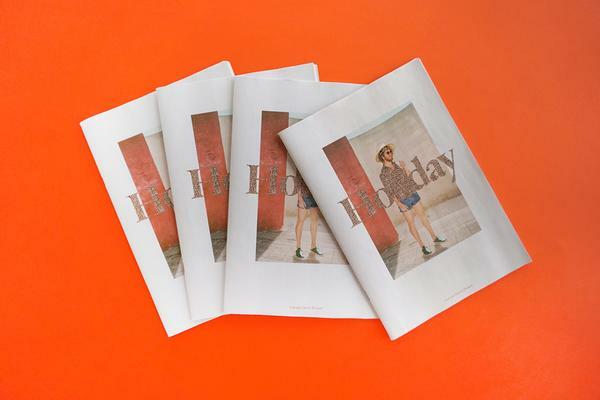 Our most popular newspaper format, great for everything from weddings to portfolios to posters. 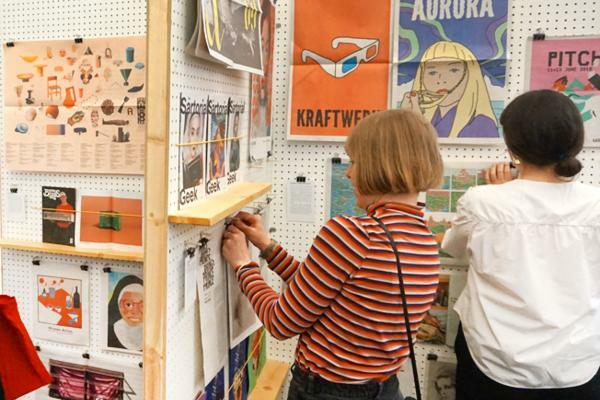 They're easy to try out, with print runs starting at just one copy.